Ethiopia isn't regarded as a premier wildlife destination in Africa - most visitors to the country are attracted to its rich cultural and historical heritage or to the excellent trekking opportunities in the Simien Mountains. However there are a number of fascinating creatures endemic to the country, in particular in the national parks of the Simien and Bale Mountains. The highly endangered Ethiopian wolf is the world's rarest canid, restricted to small pockets of the Simiens and Bale Mountains - sightings are rare but special. A much commoner sight in the Simien Mountains are the huge troops of Gelada baboons, which will happily forage or groom themselves in your presence. Other endemic Ethiopian species include the Walia ibex, mountain nyala and Menelik's bushbuck. Bale Mountains National Park is situated on a high plateau with a terrain of moorlands, spectacular volcanic peaks, deep rocky gorges and alpine lakes. The park has excellent birdlife viewing with over 200 species identified as well as being home to several animal species endemic to Ethiopia - the rare Ethiopian wolf, Menelik's bushbuck, mountain nyala and the giant mole rat. In the Harenna Forest, you may also spot bushpig, giant forest hog, grey duiker, leopard and lion. 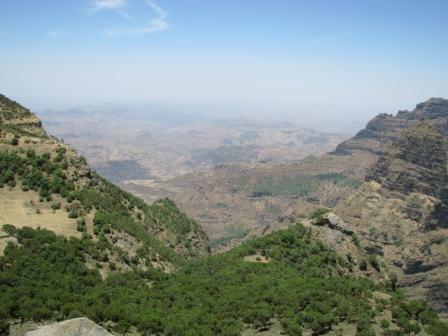 Organised group tours: Click here to see 2 tours to Ethiopia which may include Ethiopian Wildlife.